Hoopapalooza returns to Shoreline for its 10th year on Saturday, January 19 with non-stop, high-flying boys and girls basketball action from noon to night! 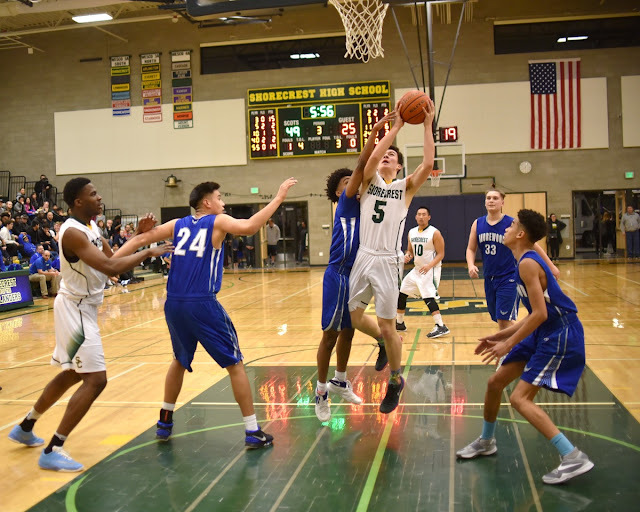 All of the Shorewood and Shorecrest basketball teams will face off for some friendly competition and cross-town bragging rights. This year’s games will be held at Shorecrest High School, 15343 25th Ave. NE. Shorecrest Girls Varsity will be entering the matchup with hot hands. They are currently 7-1 in conference play and 12-1 overall. The Shorewood Girls Varsity will be looking to turn the tide after a 2-5 conference start and 4-9 overall record. The Boys Varsity teams will also be looking to find some rhythm and momentum as push into the second half of the season. The Shorewood Boys are 3-3 in conference matchups and 4-8 overall. The Shorewood Boys are 3-4 in conference and 7-6 overall. Admission is just $6 for adults, $4 for seniors/children and free for high school students with their ASB card. And, as always, the BEST popcorn in WesCo is just $1.